Cut the corn off the cobs and discard the cobs. Combine corn, zucchini, egg, onion, cheeses, garlic, salt and pepper, flour, and cornstarch/arrowroot powder in a bowl. Mix well. Heat oil in frying pan over medium high heat, and when it starts to bubble, drop the fritter batter by ¼ cup scoops into the pan. Flatten the dough out with the bottom of a cup to encourage crispy edges (if they stay mounded, the center will be doughy which isn’t ideal). Fry the batter in two separate batches, and flip each fritter when the bottom half is golden brown and crispy. Fry the other side until it’s browned as well. Scatter herbs on top, and serve over salad greens, as a side dish, or with an egg on top for a delicious breakfast! Our 2019 summer CSA info is here! Click here to sign up. Our winter CSA information is available here! We are still accepting new members. We have sides or quarters of beef available. Call the office at (716) 655-4486 to place an order. You can have it cut to your specifications. 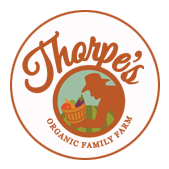 All content property of Thorpes Organic Family Farm.